The eloquent and uncompromising calls for social righteousness by some of the Minor Prophets are familiar to many, yet the writings themselves are probably the least studied and least known texts of the Old Testament. Those who are familiar with these books are also aware of the historical and literary problems that plague their study. Drawing on insights from various perspectives theological, historical, and literary this commentary on Joel, Obadiah, Jonah, and Micah by Leslie Allen carefully and imaginatively reconstructs the stage on which the message of these four books was conveyed to their Hebrew hearers and shows what relevance, in turn, they hold for contemporary Christians. For each of the books there is a substantial introduction in which the full range of scholarly opinion is presented and assessed, a select bibliography, the author's own translation of the text a significant contribution to biblical studies in itself and an extensive commentary. The commentary on Micah is the basic one of these four in that it treats at greater length some of the same forms and motifs that appear in Joel, Obadiah, and Jonah. The introductory material for Joel includes discussions of canonicity and textual criticism that apply to the entire volume. 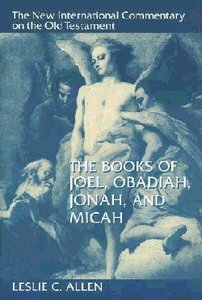 About "The Books of Joel, Obadiah, Jonah, and Micah (New International Commentary On The Old Testament Series)"
Leslie C. Allen (Ph.D., DD, University of London) is Senior Professor of Old Testament at Fuller Theological Seminary. He has written many Old Testament works including Psalms and Ezekiel (Word Biblical Commentary) and Chronicles (The New Interpreter's Bible and Communicator's Commentary on the Old Testament), Ezra-Nehemiah (New International Biblical Commentary) and Jeremiah (Old Testament Library). In addition to mentoring PhD students, Allen teaches courses on the Hebrew Prophets, Writings, Psalms, and Lamentations. He is involved in associations in both the U.K. and the U.S. including the Society for Old Testament Study, Tyndale Fellowship, the Institute for Biblical Research, and the Society of Biblical Literature.